There are very few bank based savings options available for general consumers and the most popular amongst them are Fixed Deposits and Recurring Deposits. Today lets see the basic difference between FDs and RDs, which gives better returns and when to use what. Why do banks ask for Deposits? First understand why banks needs deposits. Only with the money you deposit, banks will be able to lend money to people who ask for loans. They will give loans at a higher rate of interest than the rate of interest they give for deposits. This difference between the rate of interests is what earns profits for the banks. When you create a Fixed Deposit account, you deposit a fixed amount of money for a fixed period of time. And the bank provides a fixed rate of interest for that period of time. The rate of interest is usually higher than savings accounts as you have been locked into that account for the term. So they are also called Term Deposits. The minimum tenure for fixed deposits are 7 days and the maximum is usually 10 years. For terms spanning few days, the rate of interest will be very similar to Savings accounts. 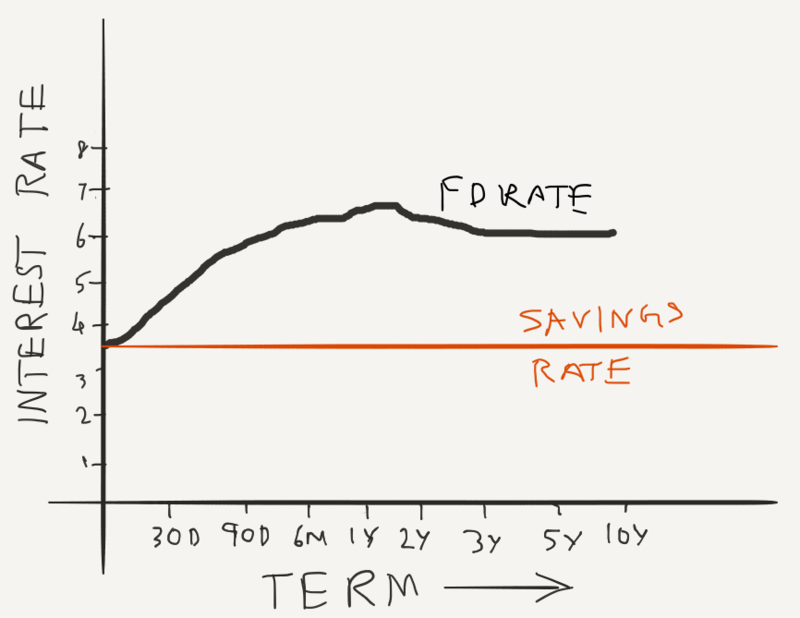 As you go to a year or more, the interest rate hits a peak and beyond 2 years, the rate decreases slightly. If you plot the graph of interest rates, you would get a curve like this. Even though the money is locked into the bank for the term, you can withdraw the money prematurely if you agree for a slight penalty in the interest rate. The penalty is only on the interest you earn and not on the actual money you put in. So you don’t have to worry about liquidity of your money. When you start a Recurring Deposits (RD) account, you agree to deposit a fixed amount of money every month on a particular date and agree to withdraw it after N deposits are made. The rate of interest is also fixed when you start the account. It is calculated on each installment you pay according to how many months it was with the bank. So if you start a 12 month deposit, the first installment will earn interest for 12 months and the last deposit will earn interest only for the last month. RDs always has a minimum of 6 months of investment period and can go upto a maximum of 10 years usually in multiples of 3 months. After the minimum 6 months is done, you can stop the RD any time you want. This brings us to the main difference between both in terms of returns earned. Lets compare a fixed deposit of Rs.1,20,000 vs a recurring deposit where you deposit Rs.10,000 every month for 12 months term. 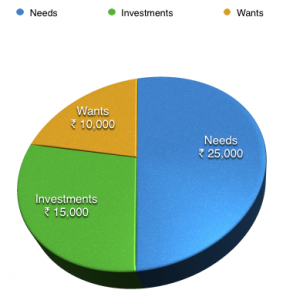 I am using a calculator from HDFC Bank website and currently the rate of interest is 6.9%. You can put in your numbers and get your results. Calculator for FD and RD. At the end of 1 year, the FD will have a maturity of Rs.128497.00 and the RD will have a maturity of Rs.124589.00. The difference of the interest earned is almost twice in FD vs RD. This clearly shows that FDs will always have a better return since you have deposited all the money at the beginning of the term vs monthly. FDs also has other advantages. You can choose a much smaller term (like few days) than RDs (minimum 6 months). And you can also prematurely break the FD and withdraw your money. FDs also has the advantage of quarterly or monthly payout. This is useful for senior citizens who have large deposits and would like to get back a fixed monthly income from the deposits. But the best way to “invest” in FDs is to let it compound (by default quarterly) so that even your interest earns interest over a time period. The most important benefit I could see from FDs are the sweep-in account where you link your savings accounts with your FDs and can sweep in excess balance into FDs and back into savings account whenever you need it. So does that mean Recurring Deposits doesn’t have any advantages? No. They are very useful for people to start getting into the practice of regularly saving every month. If you setup a RD to take away money from your salary account at the beginning of every month, you will soon get used to having lesser money in your account and naturally your expenses will come down. In fact, investing in RDs was how I introduced the savings habit for my wife. In the beginning when she handled her finances herself, I made her to put in a RD on the 5th of every month. And naturally this built up a nice corpus of money which was useful when we needed the money. Now since she has gotten into the habit, she has progressed into SIPs and investing in equity mutual funds for long term wealth creation. She still has an RD account to save up money for vacations. Which brings us to the next point of saving up money for short term expenses. Some might have planned for a vacation in the next 6 months or might have marriage or educational expenses in a year or so. For salaried individuals with such tight deadlines, it is easier to start an RD account which automatically debits the account from their salary accounts. Unless you are in the top tax bracket, RDs are good enough instruments to save money. Finally it comes down to what you capabilities and goals are. Whether you have a bulk money to invest in? or want to invest monthly for some short term goal. Choose the right deposit type for the right goal. I have talked about Public Provident Funds and how they are a safe form of investment. Salaried people would have also heard about EPF or Employees Provident Fund. Many have doubts about the difference between the two – whether both are necessary or can we have just one. Lets see what and how each scheme works and how they are different or similar to each other. money deposited in this is exempted for income tax under section 80C. during withdrawal (after maturity) the money you get is also exempted from income tax. This is what is referred to as EEE (Exempt-Exempt-Exempt) in income tax jargon. Most long-term savings or investments come under EEE. Both EPF and PPF enjoy the EEE status, so any money you put in helps you save taxes and any money you earn & take out is also tax-free. This is a retirement benefit scheme available to salaried employees. Every month 12% of your basic salary + dearness allowance is deposited by the company into a EPF account held in your name. The company also needs to make an equal contribution to your account. The employee can choose to contribute more than 12% of his salary (say 15% or 18%) if the scheme allows, but the employer is not obligated to match beyond the minimum 12%. Currently the rate of interest you earn on the money you have in your account is 8.75%. This rate is periodically adjusted for the entire financial year. If you urgently require some money, you can take a loan against your EPF. Premature withdrawal is not allowed unless there is a strong case for it – like buying a plot or house, education, wedding, medical treatment, etc. Each reason has specific rules and limits for withdrawal. When you switch jobs, you can transfer the account to your new employer. This makes sure your compounded interest isn’t lost by closing and opening new account. Withdrawal immediately after you quit your job is illegal, unless you couldn’t get a job for over 2 months. The best part I personally like about EPF: You don’t even get to see the money deposited in your salary account, which means you can never spend this to buy anything unwanted. Many people fail to understand the amount of money they need at retirement. This is why the government has set up the rules so that your money automatically gets saved and taken care of. Don’t you love it when someone else takes care of your money problems? The Public Provident Fund is a retirement scheme run by the central government. Unlike EPF, any citizen can open a PPF account in his name. You can have your own business, be a consultant, work in a small company (which doesn’t come under EPF laws), even open a PPF account under your children’s names. Anyone can open PPF account in any nationalised banks or post office branches. However each person can have only one PPF account in his name – across all banks and post offices. You can’t open an account in SBI and then goto ICICI bank to create another account – that is illegal. You can deposit a maximum of Rs.1,00,000 per financial year in your PPF account and a minimum of Rs.500 is required every year to keep the account active. Your account is locked in for a period of 15 years, but you can extend it in blocks of 5 years every time. Like EPF, you can take a loan against your PPF account, but only from the 3rd year of your account. If you open an account in this financial year (2014-15), you can take a loan from 2016-17. That too only up to a maximum of 25% of your balance at the end of first year. You can make withdrawals, but there are also lot of rules and limitations on how much you can withdraw and from which year. I would suggest to never touch your money in Provident Funds as the compounded effect would be phenomenal when you get your check when you retire. PPF accounts earn interest at the rate of 8.7% (compounded annually) as of now and this rate is also updated occasionally. But the best part of PPF is, if you are bankrupt or involved in some legal dispute, a court cannot attach or ask for the money you have in your PPF account. That money is yours whatever happens. Since provident funds are run by and has the backing of the Government of India, it is the safest form of savings you can do for your retirement. Of course with higher safety your potential for growth is also reduced. If a person just uses provident funds for his retirement, he would be losing money with the current prevailing inflation rate. There needs to be a balance between safe investments and high return investments for better growth. In the previous post I had suggested using a Recurring Deposit to plan for your future expenses by depositing a small amount monthly. Lets now see what the frequently asked questions regarding a Recurring Deposit are. You can login to your online banking website and immediately start an RD account within a few minutes. Note: My answers would be as much as possible applicable on all banks. However there may be a few exceptions and its better you verify with your bank’s website if you have any doubt. Recurring Deposits in a single sentence? You give your bank a fixed amount of money, every month, for a fixed number of months and at the end of the specified number of months, your bank returns your money along with some more money as interest earned on your deposits. Remember the amount and number of months are fixed and once started, cannot be changed. There are no weekly or quarterly options – only monthly. What would happen if I forgot to deposit a month? You don’t have to go to a branch to deposit the money. When you open your RD account online, it will be linked with your Savings Bank account and your bank automatically debits the money on the date you specify. You just have to make sure that you have enough balance in your SB account. Though you can go deposit it in person, I would suggest leaving that job to the computers as it will be automatic. If case you don’t have enough money in your Savings account, there might be a small penalty for every month you don’t pay. Your won’t lose your existing money, only you would have to pay extra charges when you continue. What is the minimum amount I can deposit every month? Most banks have the minimum amount as Rs.100 or 500. Usually you can only deposit in multiples of 100s. Its better to check with your bank before you begin a RD. How many months can I start the RD for? Usually banks have a minimum period of 6 months and maximum period of 120 months (10 years). There are some banks like SBI (State Bank of India) which has a minimum period of 12 months. If I start a RD for 120 months and I want to stop it after a year or so, can I? Yes, you can stop your deposits anytime you want. But your interest earned would be hit by a small penalty (usually 1%) for premature withdrawal. You would never incur a loss on the principal money your deposited. What are the interest rates for RD? As interest rates differs depending on the Reserve Bank’s rates, you should check your bank’s website before starting a RD. Currently rates range from 7.5% to 9% per annum. Is the interest earned taxable? Will the bank deduct the tax at source (TDS)? Yes. The interest earned is taxable depending upon your personal tax bracket. However the bank doesn’t deduct the tax at source and you have to proactively declare this interest income when you file taxes. Can I get loan against this deposit? Yes. Most banks give loan against the money you have in this account. Usually it is around 90% of your account balance. The interest you need to pay for that loan will also be very less compared to a personal loan. This interest rate will be around 0.5% to 1% above the deposit rate the bank pays you. Using this loan facility is better if you suddenly require some cash for unforeseen circumstances, since the interest on this would be less than what a normal personal loan will cost you. Also your deposit keeps earning interest and you don’t have to pay a penalty of premature withdrawal of the deposit. How do I calculate how much money I would get back at the end of the term? Most banks have a online calculator, where you enter your monthly deposit, period and interest rate and it would give you what you will get back at the end. Here is one from HDFC Bank. I have covered most of the common questions that people will have before opening a recurring deposit. All that remains is to login to your net banking portal and begin the RD. If you’ve got any more questions that I haven’t answered here, leave a comment below and I will reply with an answer.